Powdery smowdery took me 3 1/2 hours to get to work. I passed your house doing 3 mph this morning. Storms are supposed to continue every 3 to 5 days until spring. On the otherhand only 12 more days until pitchers and catchers report to spring training in Florida,so that gives us New Englanders a little hope that winter is almost over. At least I can reach the pedals and don't have to sit on a phone book to see over the steering wheel. hahaha Who luvs ya!! It didn't even look like I plowed this weekend when I woke up this morning, oh well more seat time. Plowed mine, neighbor 1 and about halfway through neighbor 2, the Cub quit. At the bottom of the hill, with the blade down, in the middle of the driveway, lol. It couldn't get any worse, I thought. Battery dead, AND out of gas. Cub has not been charging. Then neighbor 2 showed up after a long day at work wanting to get down the driveway! I may have to call it the snowball effect! I guess we're just getting the front part here in mid WVa. 53 today with the sun out all day, started raining at dark. 21 inches here in NE Oklahoma - Blah! I wish I had a plow on my cub to plow the 3' drift that used to be my driveway. Well, this storm is really kicking us in the We had about 3 to 4 inches of sleet on top of a 1/4 inch thick layer of ice. The roads were passable and since the sleet had fallen you could actually stand up. Actually the thick layer of sleet had made things quite pleasent. It was like walking in sand, you just did not have to worry about burning your feet That is when things went bad. This evening it started with more freezing rain All was going well until the fire pager went off for power lines down. I headed to the fire house avoiding the limbs that had fallen in my driveway only to get stuck on a log (bigger limb, but it is my story) in the middle of the road that I could not avoid due to the nasty road conditions. Worked my truck off of that, got to the fire house safely then on to the scene. Shortly after arriving on scene power poles started coming down around us. Everyone and all equipment got out of the way just in time. While directing traffic, my phone started ringing nonstop. Seems that other power lines were coming down and that now Grandma and Grandpa, Uncle and Aunt, Cousin, and myself were all out of power. I finally got home from the call, and still no power. We spent 8 hours without power, and just as I was going out to start the generator it came back on. I look outside and see limbs down all over and 3-4 inch icicles hanging off of all power lines. I can't help but think that with the 60 mph winds they are saying we could get that this is far from over. Maybe I'm in the eye of the storm. I got about 8 inches yesterday and now have around 3 so far today and is mixing with sleet supposed to go back to all snow later total of another 4 - 8 today. Work is shut down and the wood stove is cranking, going to wait it out and then get started on clean up. This area of the state pretty much shut down second day in the row. No snow overnight. High winds kicked in about 4 a.m. Temperature has started dropping and we are getting snow flurries now. No joy in Cubville today! Plowed about 2" of snow and 1/2" of ice last night.... popped above freezing and raining now and through today. I think the little snowman ornament in a plastic box that's been on the platform of the Lo Boy since Christmas could be some kind of snow genie or something..... Hasn't stopped snowing since he and the Cub bonded.... mmmmm could it all be my fault?? 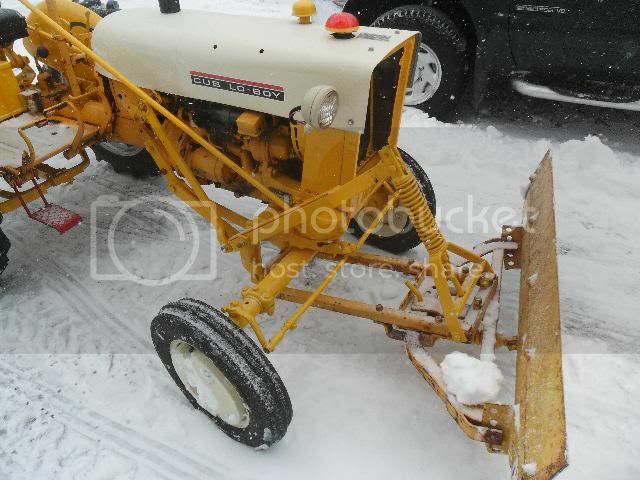 Farmall Cub fun in the snow!